Jenson Button and Sergio Perez have settled their differences over their Bahrain Grand Prix duel in a behind closed doors meeting with senior team management, AUTOSPORT has learned. After the pair clashed on track in an aggressive fight for position at Sakhir, Button and Perez spoke out against each other immediately after the race. With the matter having spilt over in to the public domain – both through team radio broadcast on television and post-race television interviews – McLaren team principal Martin Whitmarsh and sporting director Sam Michael elected to ensure that the matter did not continue into the break before the Spanish GP. In an exclusive interview with AUTOSPORT on Monday, Michael revealed that the four of them got together late on Sunday in Bahrain to vent their true feelings so the controversy did not cloud the rest of the campaign. “Both Jenson and Checo had an opportunity to express their views to us, and then we gave them the team’s position,” said Michael. “That position is quite simple: McLaren allows both its drivers to race hard and fair, and in return its drivers must respect that trust and mustn’t let the team down. Michael has revealed that in the meeting both Button and Perez admitted that they could have handled the race situation better, while the team also reckoned it played a part in not helping the matter. “Checo was understandably pleased with his performance, but he appreciates that at times it was too close to the mark,” said Michael. 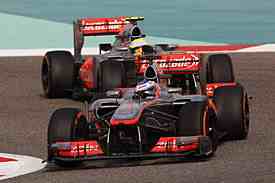 “Likewise, Jenson acknowledges that during the race he reacted harshly to some of the occurrences. “Together we’ve reviewed all the detail – the precise content of which is not appropriate for external discussion. Jenson Button and Sergio Perez “However, the team also has to accept that, in not imposing a team order on either of our drivers, despite our seeing on our pit wall monitors an increasingly intense battle unfolding between them, we weren’t adopting what you could term a ‘caution-optimised’ strategy. “But that’s the way McLaren goes motor racing – always has, always will. “Some of the most exciting moments of modern-era Grand Prix racing were provided by McLaren team-mates Ayrton [Senna] and Alain [Prost] fighting each other on track in the late 1980s, and Ron [Dennis] didn’t impose team orders on them in those days either.